I’m a 17-year myeloma survivor, and I currently do not get the flu shot, mostly due to my immune system and the fact that chemotherapy further diminishes immune response. I know that other myeloma patients get flu shots annually, so what’s the answer? 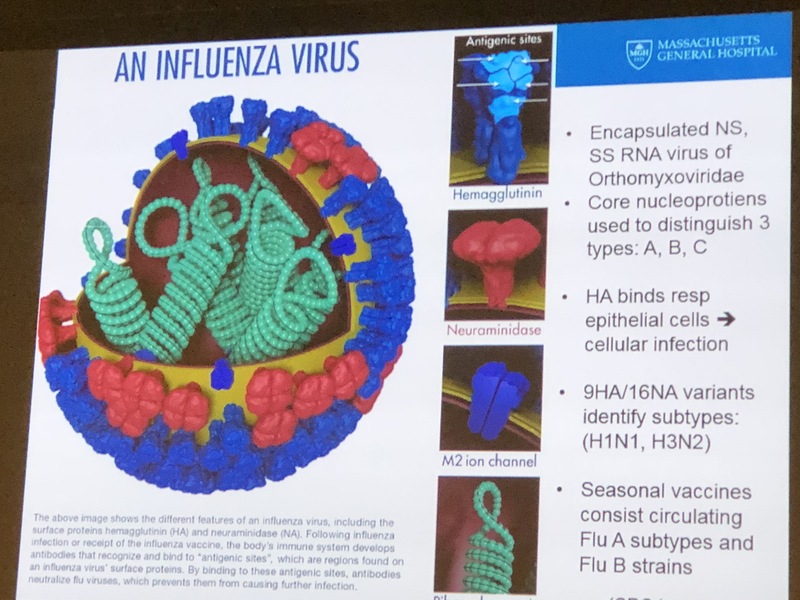 Manchester General Hospital slide about the flu virus. The information from two Quality of Life sessions presented at ASH provided me with key points to discuss with my myeloma specialist. Second, by using levofloxacin prophylactically for 12 weeks when undergoing treatment, it reduced fevers and deaths without increasing infections. It’s not always the myeloma, but infections that can get you. So, if you’re on treatment that lowers your immune system, you may want to discuss with your specialist if taking levofloxacin may be wise for you. For me, with my lower white count/immune system, maybe it’s time to start getting flu shots!